Development League (PDL) soccer in Ocean City in 2010. Unfortunately, the Ocean City Nor’easters were unable to play up to those expectations and finished the campaign with their first-ever losing record as a member of the PDL. 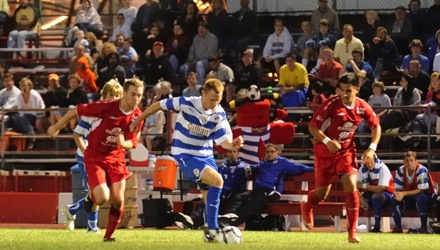 The biggest change from the 2009 team that reached the third round of the U.S. Open Cup and the national quarterfinals of the PDL playoffs was off-the-field. Since they were founded in 1997, the club had been known as the “Barons,” but after severing ties with the South Jersey Barons youth academy, the franchise decided to start fresh with a new identity. Following a “Name That Team” contest, the club’s nickname became the Nor’easters and they adopted the royal blue and white colors of English Championship side Reading FC, a club they have had a relationship with since 2008. They also created a logo inspired by the Royals’ long time shield, along with a Nor’easters logo featuring a dynamic ocean wave. "Our first season as the Nor’easters was always going to be a challenge," said head coach Neil Holloway. "Overall, I think our young team was competitive, but probably not good enough to compete with the best teams in the PDL. As a developmental team, there is always a fine balanace between winning and developing players, and we have always prided ourselves on giving young, local players opportunities to shine, and that is what we did this year." "The 2010 season was one to remember, it was our first season under a new name, Ocean City Nor’easters," said team president John Granese. "We had a lot of changes, from a new name to new merchandise, new personell and we had little time to prepare before the season started. We decided to go with a young team and from a development standpoint, we’re glad we did." The Nor’easters have been known for their fast starts, but 2010 was different. The first four games of the season doubled as qualifiers for the Lamar Hunt U.S. Open Cup, but it wouldn’t their year as Ocean City began the season on a five-game winless streak (0-3-2), the worst start in franchise history. The fifth game of that run was a narrow 1-0 loss in Bermuda as the Nor’easters traveled to the island nation for the first time to face the newest member of the PDL, the Hogges. They played two games in Bermuda that weekend and despite the loss in the opener, they bounced back in the second match to earn their first win of the season in convincing fashion. Byron Carmichael (Marshall / Lumberton, NJ), the club’s all-time leading scorer, had a goal and an assist, while Ryan Richter (LaSalle / Southampton, PA) scored a pair of goals and earned PDL Team of the Week honors. One of Richter’s goals was assisted by Giancarlo Granese (LaSalle / Ocean City, NJ), who earned his first career PDL point. That began a four-game unbeaten streak with a 3-2 win over the West Virginia Chaos and back-to-back 2-2 draws at the Carolina Dynamo and Reading United. Terry Gibbs (Bloomfield College / London, England) scored the game-winner against West Virginia in the 75th minute, assisted by defender Kevin Strunk (Lehigh / Downingtown, PA). Gibbs was named to the PDL Team of the Week for his efforts. Carmichael also earned Team of the Week honors for his goal and assist against Carolina. Strunk was the hero against Reading, scoring the equalizer in the 82nd minute on an assist by Max Hamilton (Monmouth / Medford, NJ). 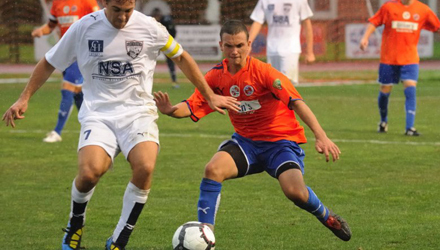 Strunk was a pleasant surprise for the Nor’easters’ backline, as the Lehigh defender played in every game in his first season with Ocean City FC. He finished second on the team in minutes played (1,373), and started 15 of the team’s 16 matches. He was named to the PDL Team of the Week for his game-tying goal against Carolina. After six straight road games, the Nor’easters returned to Carey Stadium, but lost a rare home game, 1-0 to the expansion Central Jersey Spartans. They would bounce back with back-to-back wins against the New Jersey Rangers. Hamilton and Gibbs scored in the team’s 2-0 win at New Jersey and Kyle Miller (Holy Cross / Woodbury, NJ) earned Team of the Week honors for his two goals in the 3-2 win at the Beach House (SEE VIDEO HIGHLIGHTS BELOW). Fletcher also scored in that match. With a 4-4-4 record and only four games remaining, Ocean City had to win the rest of their games to have a chance to make the post-season for the second year in a row, and the third time in four years. However, their hopes of making the playoffs were dashed in their home match against Reading United. Fletcher opened the scoring with his fourth goal of the year in the 64th minute, breaking the club record for goals by a defender in a season. But the fans at the Beach House that night had their hearts broken as Reading scored in the dying seconds of the match to tie the game and eliminate the Nor’easters from post-season contention. Despite the loss, Fletcher made the league’s Team of the Week list for his effort that night. With the final three games, the Nor’easters were playing for pride, but struggled by losing to the playoff-bound Ironbound Express 3-0. They rebounded with a dramatic 2-1 win against Carolina with Miller scoring the game-winner in the 84th minute with the assist, his third of the season, coming from Granese. Ocean City just needed a win in the season finale at Carey Stadium against West Virginia to clinch their 8th straight winning season. However, after Miller scored early, the Chaos answered with two goals in the final three minutes to give the Nor’easters their first losing season in their eight years in the PDL, finishing with a 5-6-5 record. It’s hard to point to one particular thing that went wrong. The offense struggled to score goals, finishing as the lowest scoring team in the club’s 14-year history with 23 goals scored in 16 games. The defense also gave up 25 goals, the second-most in the club’s PDL history (2003-2010). Some members of Ocean City FC take a swim during their trip to Bermuda. The Nor’easters split their two-game weekend on the island nation, losing the first game 1-0, but beating the Hogges 3-0 in the second. The story of the season may have been giving up late goals and giving up the lead. Four of their six losses were by one goal, and in five games this year, they lost the lead, having to settle for a draw in four of them. They gave up a game-winning or game-tying goal in the 66th minute or later five times (2 losses, 3 draws). “Looking at our results and the way in which we failed to hold on to leads, shows me that we were too inexperienced at this level," said Fletcher. "I don’t think that the players we had were not good enough to excel at this level but merely too young. We did not close out games when in control and ultimately that’s what lead us to tie so many games, games we should have won." Despite the disappointing team results, there were some impressive individual achievements for Ocean City FC. Byron Carmichael, who returned for his seventh season with the club, added to his all-time regular season scoring record by leading the team in points for the fourth year in a row. Carmichael scored a career-low five goals, but managed a career-high five assists to give him 15 points. His first assist of the year, on a Terry Gibbs goal against Hampton Roads in the season opener, gave him 20 career helpers, breaking the tie with Ruben Mingo for the all-time lead in that category. The Lumberton, NJ native finishes the year with the club’s career record for goals (57), assists (24), points (138), games played (102) and minutes played (7,236). Carmichael was voted as the club’s offensive MVP by the coaching and front office staff. Carmichael topped the scoring list and was named the team’s Offensive MVP, but it was a four-way tie for second place with eight points. John Fletcher and Kyle Miller each scored four goals, while Ryan Richter and Terry Gibbs each put three into the back of the net, and assisted on two others. Goalkeeper Tunde Ogunbiyi (Boston College / Gwynedd, PA) was back for his third season on the boardwalk. Last year’s All-Conference goalkeeper played in 13 games and amassed a 4-4-4 record with one shutout. Ogunbiyi was under fire throughout the season, finishing 7th in the PDL with 73 saves, and breaking the Ocean City career record in that category with 157. The Boston College keeper also broke the club record for goalkeeper minutes played (2,520) and finishes the year ranked 3rd in career wins (11 – Ryan Carr leads with 17), second in goals against average (1.25 – Adam Edwards leads with 1.01) and shutouts (7 – Adam Edwards leads with 8). A couple players moved up the all-time list, including Richter. The LaSalle forward had three goals and two assists in 16 games, and finished with 11 career goals, which ties him with Ryan Heins for fifth on the all-time goalscoring chart. Richter also ranks sixth in scoring with 27 points and he moved up to ninth in minutes played (2,621). Fletcher had a tremendous individual season as a central defender and was named the team MVP. The captain, playing in his third season with Ocean City, but his first full season, scored four goals for the team, a new single-season record for defenders. By season’s end, Fletcher found himself tied with Joe Banks as the club’s highest-scoring defender with six goals and one assist (13 points.) Banks, who hung up his boots this past season to focus on coaching, also has six career goals and one assist. Kevin Curran (Loyola College (MD) / Ocean View, NJ), playing in his second season for the Nor’easters, was voted as the defensive player of the year. Curran rebounded from last year’s injury-shortened season where he earned a starting job as an 18-year old rookie, and even made the starting 11 against Major League Soccer’s D.C. United in the third round of the Lamar Hunt U.S. Open Cup. After he recovered from his injury, he helped Loyola College reach the NCAA tournament in the fall. Fletcher was referring to the four late-season promotions from the youth academy roster: Giovanni Tacconelli (Lenape HS / Iona College / Mt. Laurel, NJ), MJ Nestor (Wildwood Catholic / Iona College / Avalon, NJ), Colin McFadden (St. Augustine Prep / Univ. of Scranton / Ventnor, NJ), and goalkeeper McKenzey Scott (Wildwood Catholic / Drexel / Cape May, NJ). Tacconelli started the last three games of the year, Nestor played in the last three, starting one, and McFadden made his PDL debut against the Ironbound Express on July 14. Scott came off the bench in the last game of the season against West Virginia and all four hope to establish a young foundation for years to come. A recent Super-20 alum who made an impact was Giancarlo Granese. Granese, who redshirted his freshman year at Hofstra last fall, made the PDL roster at the beginning of the season, and after starting out as a substitute, he earned a starting job. He finished the season second on the team with three assists and ended up playing in all but one game, while starting seven of them. Granese will have a different home in the fall, as he is transferring to LaSalle University in Philadelphia to join a number of his Ocean City teammates, such as Dan Korenyi (Cinneminson, NJ), Austin Johnson (Middle Township, NJ), Junior Chapman (Winslow, NJ), and Richter. "I was pleased that we were able to field such a young team this year and remain competitive," said Holloway. "Giving PDL debuts to Giovanni Tacconelli, MJ Nestor, Colin McFadden and McKenzey Scott, players that I have seen develop from the age of 13, was very satisfying." "My hope for next year is that the younger players we bring back will have learned from their experiences this season," Holloway added. "We will look to add key players in certain areas and continue to develop this young group of players. I fully expect us to back at the top, among the elite clubs of the PDL in 2011."